“four days after Walls entered the facility no one ever heard from him again. Wondering why he hadn’t called, his aunt visited the center on Dec. 9 to see him in person and was told he had packed all his stuff and left five days earlier, said Ketter-Walls. Surprised and worried, his family and friends began asking around town for him. Did he relapse and was hiding out? Did he overdose and die? They called morgues and hospitals. They checked local drug hangouts. They visited a Burger King he frequented and showed his picture to staff. Nothing. “On Jan. 11, 39 days after the family last spoke to Walls, a pest control worker entered his room at the Hudson Mohawk center and found a badly decomposed body on the bed. It was Walls. He had been there the whole time…. Oh, what a tangled web! They started by telling me I wasn’t being forced into AA, and through a snowball of lies ended up denying that this guy was dead or that he wrote the book on how to force people into AA. It wasn’t until the state police got involved that NYS Office of Professions even acknowledged knowing he passed away, and then it took more effort to get them to update public records, which they did not think was important. NYS Office of Professions and ARISE Network still suggest that this may not be the author of Invitational Intervention and have not confirmed that he indeed wrote that book and was charged with five felonies. NYS OASAS has not explained why there is no record of him ever having a NYS CASAC license online. I think that there was an attempt to quietly remove him from OASAS records. He was a licensed CASAC before the felony charges and my complaints. UPDATE (2018) James Garrett has been recorded as DECEASED by NYS Office of Professions. ARISE Network and NYS Office of Professions still suggest that it may be a case of ‘mistaken identity’. Samaritan Counseling and NYS Office of Professional Discipline have not acknowledged Garrett’s Class A Misdemeanor conviction in 2014. The state police must have contacted NYS OPD, because this includes information that I only spoke to the state police investigator Baskerville about, involving the possibility of fraud to be committed with a license that should not exist, as if I had made those allegations. My only seriously actionable allegation was that the license is invalid and should be closed, according the NYS OP website, to prevent further fraud. So, for some reason New York State Office of Professions is digging in its heels when it comes to changing a database record about the fact that this guy is dead. Our office received your conduct email complaint specific to LCSW James Garrett. My office has already addressed your complaints specific to Samaritan Counseling Center as well as your prior therapist, Ona [sic “Oona”] Edmands in 2016. The email forwarded now continues to discuss your issues with that program and the staff you were involved in however you allege that this agency is still billing under a former employees license, specifically James Garrett LCSW. However, there was no examples or evidence base for this allegation, such as a current bill submitted to an insurance provider under his name and license number. Do you have such evidence? I ask because this would be a criminal matter and we would encourage you to file a complaint with the local authorities. If another licensed professional is fraudulently using Mr. Garrett’s license number than we would investigate that licensed professional for fraud; however you did not provide any evidence at all that Mr. Garrett’s license is being used fraudulently. Based on your letter the only evidence you have that this is occurring is because NYSED still has his license listed and he is still actively registered. The division for professional licensing cannot take away or de-activate someone license based on a report of death. My office did confirm that James Garrett LCSW did pass in 2017; however his registration was already renewed for that time period. DPLS (licensing) requires that upon death of a licensee the immediate family must contact them and provide a copy of the death certificate in order for them to de-activate his registration. He is currently registered until 6 of 2019. His license will become inactive after 6/2019 even if his family does not provide proof of death for he can not renew due to being deceased. I just wanted to let you know that we (OPD)are aware of his passing but in order for his registration to practice under that license number to be revoked the immediate family member must make notifications and send proof of death. So, if you have actual tangible evidence that someone is using his license number to practice or bill please forward that evidence to my attention at this office, or bring it to your local police department if you want criminal charges pursued. She referred me to the DPLS office who told me that James Garrett would get no communications for a renewal. He would not answer my question and then hung up on me when I asked repeatedly if the website would be updated. The guy sounded intoxicated. I haven’t got in touch with anyone who will answer my question to Deborah Sansone about where it says that ‘reliable notice’ means ‘next of kin’. Here is the original complaint sent to NYS Police, who then called me to tell them my story, and I explained how a common form of insurance fraud is the business use of a credentialed individual’s license while s/he just ‘signs off’ on it. My specific complaint was just that the ARISE Intervention Network denied his death, which could only have been to make me feel crazy again, or to make people doubt my information if a whole network of professionals is saying I have no idea who I’m talking about. I’ve been trying to reach the offices of former Samaritan Counseling Clinical Director Jenness Clairmont or Oona Edmands (witnesses to addiction treatment crimes) for at least 4 years now without any success regarding a fraud scheme at Recovery Resource Center in Albany NY. It is possibly still ongoing, because the LCSW-R license for James Garrett still exists. I have reported his death to the Office of Professions, and they refuse to acknowledge it and close the license to prevent potential insurance fraud. 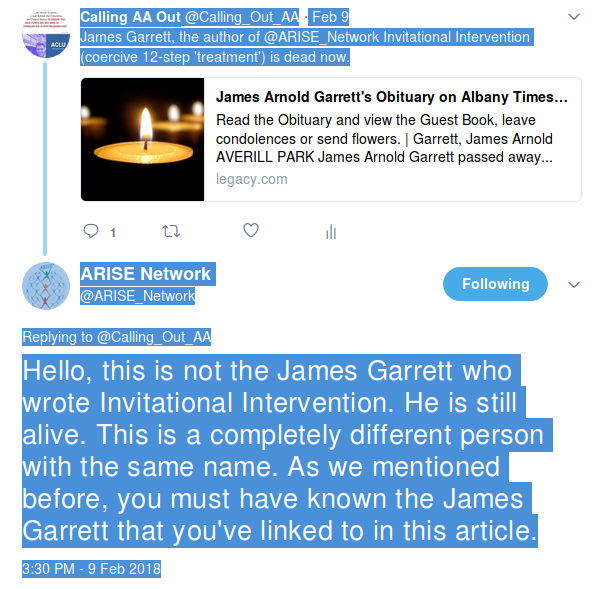 The ARISE Intervention Network has in fact publicly stated that he is still alive, which appears to be a completely false statement with no purpose other than to deny involvement with felony charges publicized in the Daily Gazette. OASAS has refused to acknowledge any reason for the complete disappearance of his CASAC license, or to acknowledge that he was charged with five felony counts by state police (which would legitimize my similar complaints which have been so far dismissed as nonsense). It is not clear that my complaints have been investigated properly by the NYS OMH or Education Department, so I am hoping the state police can get involved. 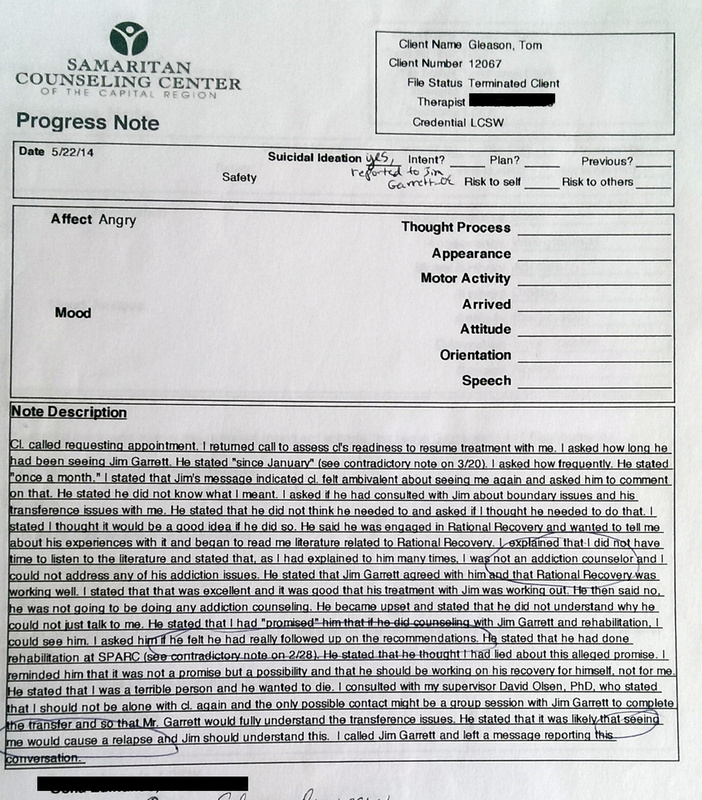 AFTER he was charged with five felonies (in Jan 2014) for offering a false instrument for filing, and BEFORE I was terminate-referred to him repeatedly by the LCSW Oona Edmands, there were several indications that James Garrett was using his status as ‘expert’ to interfere in my attempts to communicate with the mandated reporter and witness Oona Edmands about what I was realizing to be an ‘addiction treatment’ scam he was running. I was never able to communicate the situation to the mandated reporter, specifically because of how his scam worked to block me from doing that. 1. 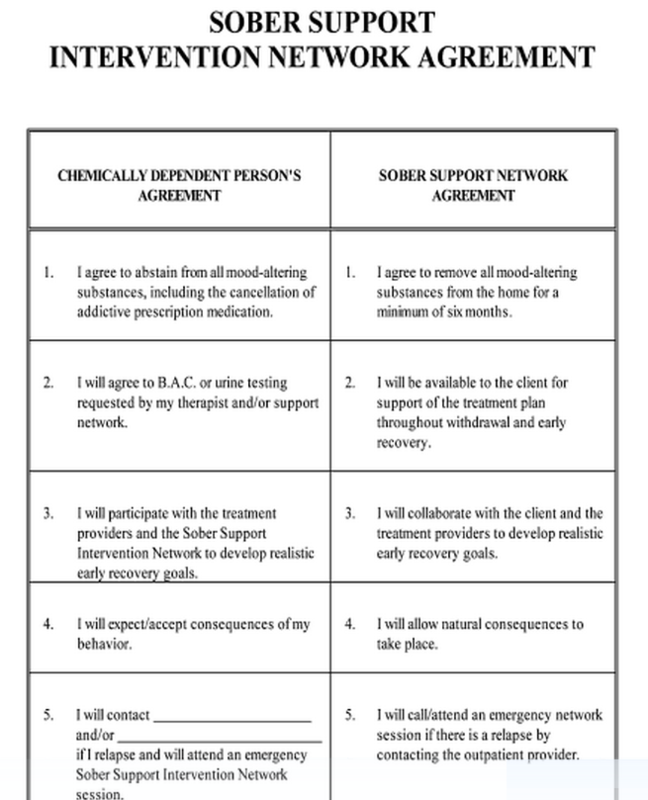 Reinforcement of ‘intervention’ ‘contract’ (telling my family and other LCSWs to terminate or ignore me unless I was paying him to ‘monitor my sobriety’ — essentially just paying him to NOT create ‘consequences’ for leaving his ‘gradually escalating’ ‘treatment’ requirements– aka a ‘racket’). 2. Suggesting my attempts to complain about his scam were just imaginations, manipulations or ‘disease’ symptoms. Yet, state police charged him with five felonies for offering a false instrument for filing, so obviously there were other people who saw a serious problem with how he conducted his business. I did not know about the charges brought against him at the time by state police, and it is not clear that Oona Edmands, LCSW did either. That case happened to be in the exact same time frame as my very similar experiences with him, and I wasn’t aware of it until last year when I found it in the Daily Gazette. 3. Describing my preferred therapist, Oona Edmands, as unqualified or ‘not equipped’ to deal with an ‘alcoholic’, and portraying her ‘codependence’ as a danger to my ‘Recovery’, which made her incompetent to function as a mandated reporter in support of my best interest without fear of malpractice. It was apparent to me that Oona Edmands, unwilling to be involved any further in the situation or to report it, therefore abandoned me to this fraudulent treatment instead of acting as a mandated reporter; therefore, the problem was never correctly addressed. I would like the state police to investigate Recovery Resource Center of Albany NY, which is still running in some capacity despite James Garrett’s death, while his death is being denied by the ARISE Network. Again, I suspect the fraud scheme is still active in some way. I would also like the police to contact the NYS Office of Professional Discipline to ensure that they are aware of the death of James Garrett and close out his license to help prevent further fraud. “Prior to passing the licensee renewed his license. The renewal is always a three year period. Since he renewed in 2016 and paid for this renewal he will show up as licensed and active until July of 2019. His renewal being due in 2019, either a family member will forward his death certificate as evidence of his not renewing and DPLS will automatically change his status from active to not active. The web will not he is deceased when DPLS receives the documentation they require. If you have any additional questions regarding their policies I would suggest you contact The Division of Professional Licensing at our education department in Albany. 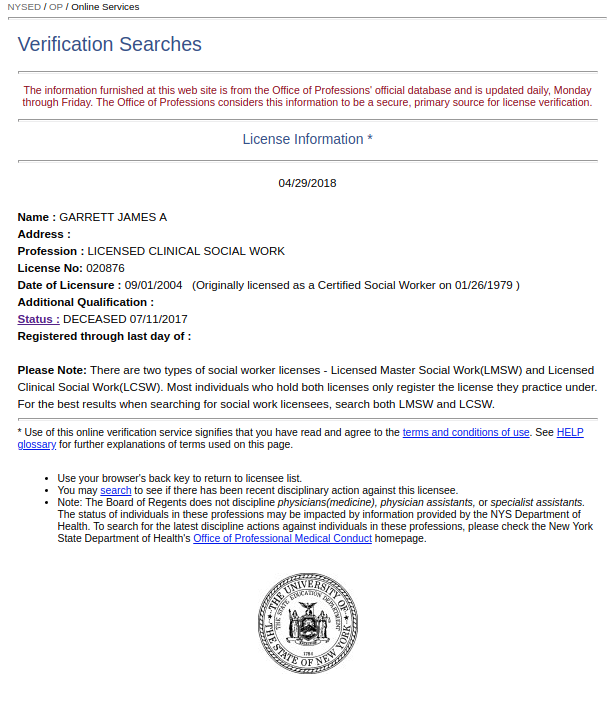 In reference to other professionals in the field referencing an alive James Garrett who is a social worker, this is not evidence of his specific license being used fraudulently by anyone or any agency. 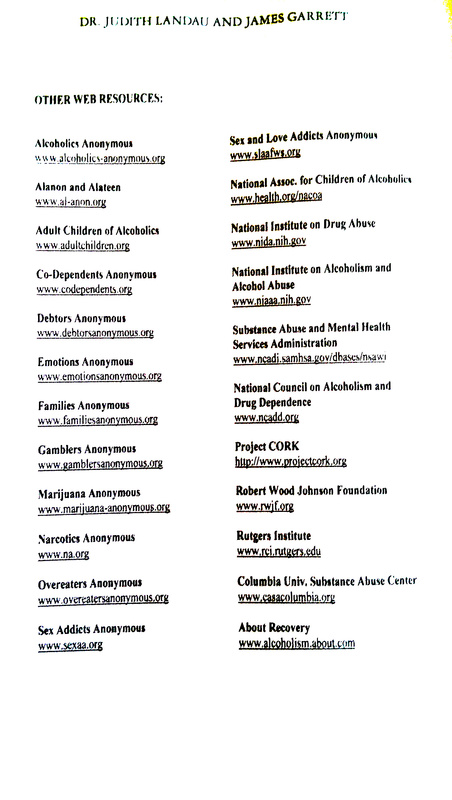 In NY state alone there are numerous licensed professionals in the mental health fields by that name. As indicated above you can contact NYSED at 518-487-3817, I believe it’s extension 340 for DPLS. No response. I emailed asking for confirmation that they had received my communication. No response. I have only found one James Garrett LCSW on the NYS Office of Professions website, and no record of him on the OASAS website. This website documents my complaints about treatment at Recovery Resource Center in Albany. 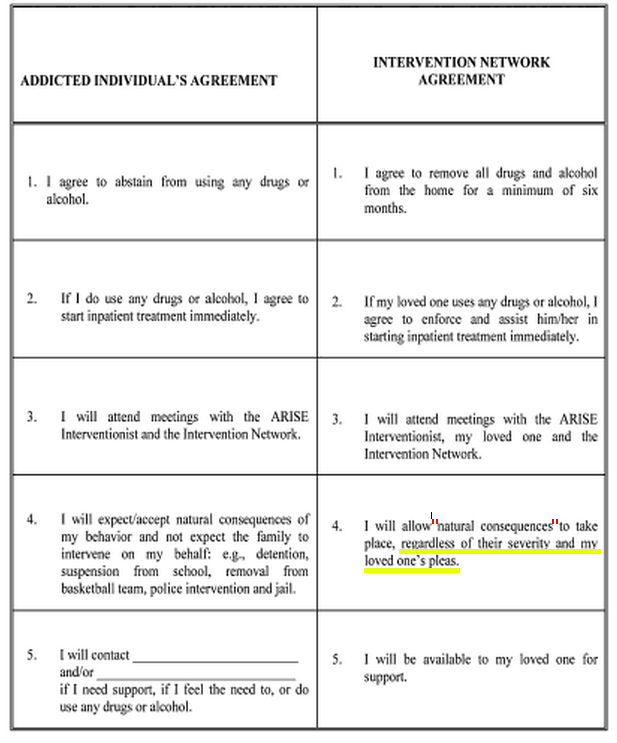 It has included my own medical records suggesting that a provider by the name of James Garrett ‘treated’ me as Samaritan Counseling‘s preferred addiction treatment ‘expert’, and documented concerns about his treatment model called the ARISE Intervention. The problem is that in September of 2017, the ARISE Intervention Network tweeted to me that my complaints must have involved another person by the same name. They said it was a case of ‘mistaken identity’. 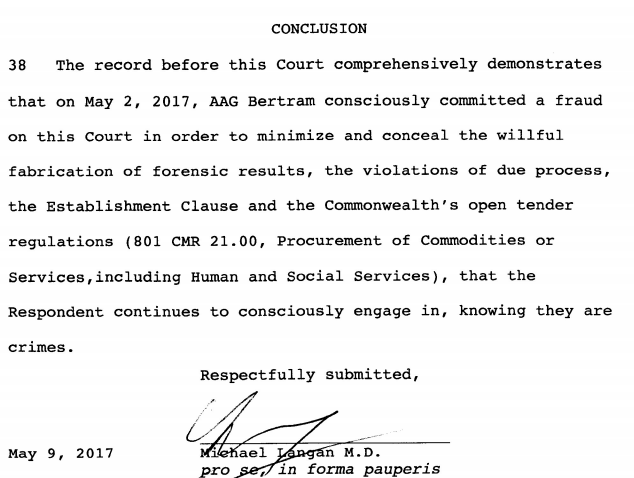 I had recently exposed that James Garrett was charged with five felonies for fraud in another case, endured a 2 year suspension of his license in 2001 for “admit[ting] to charge of having been convicted of Criminal Facilitation in the Fourth Degree, a Class A Misdemeanor”, and had published my own medical records suggesting that he was suppressing complaints and extorting me. “That licensee is currently registered, but we have no way of knowing whether or not he is still alive. He could have passed away since the last time he registered (2016). Sometimes the family notifies us of a death, but we have no way of knowing if no one notifies us. 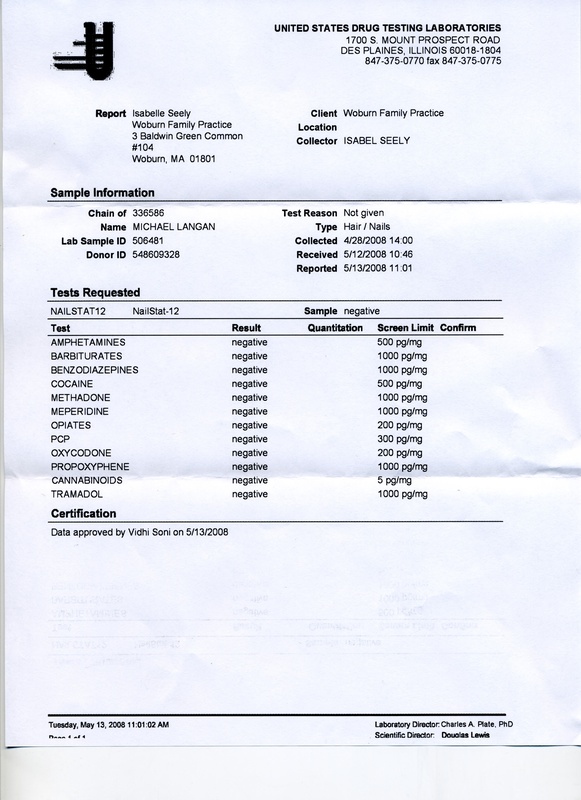 “I am notifying you of a concern about this licensee’s health status (alive or dead). Do you have no family contact information to verify and update your records? “No. We do not collect or maintain information on licensees families. “You can’t even attempt to contact him directly? “To determine if he is dead or alive, no. The conversation went on a bit, her telling me that this was for the Office of Professional Discipline to handle, but when I asked her to forward my concerns, she told me that I could not use her inbox to circumvent the cease and desist order that NYS Office of Professional Discipline has against me, and that she would not forward my concerns. Today I tried to call James Garrett directly, but found the number published on his website is a fax machine. I have asked the Office of Professions if they have any contact information for their currently licensed LCSW, so that I can hear his voice and verify that he is alive, as the ARISE Network says. …which I took to mean that even if I can provide a death certificate, they will not accept that as evidence of his death. Also, that if I filed a FOIL request, I would not get access to information about whether NYS Office of Professions or any related agency like OASAS knows that James Garrett is in fact dead. It seems that NYS Office of Professions may never have to acknowledge his death, which is kind of strange, considering that the ARISE Network is using this to confuse and deflect from facts about their treatment. On the other hand, they don’t seem to have noticed that the whole point of my complaint about the HIPAA request for amendment (of my complaints to my medical records) is that it should not be necessary to post your private medical records online to make a point. 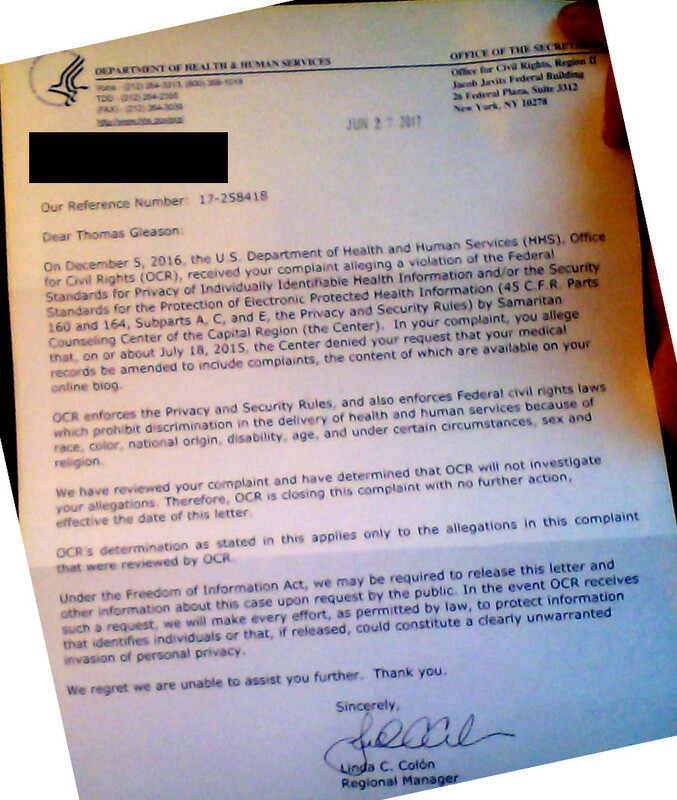 Any professional I might see in the future should be able to see that I made serious complaints if they were to review my historical medical records (they would NOT see any of my complaints, to be clear), and should not have to go on a (probably illegal) cyberstalking expedition to my blog to learn the facts about my case. 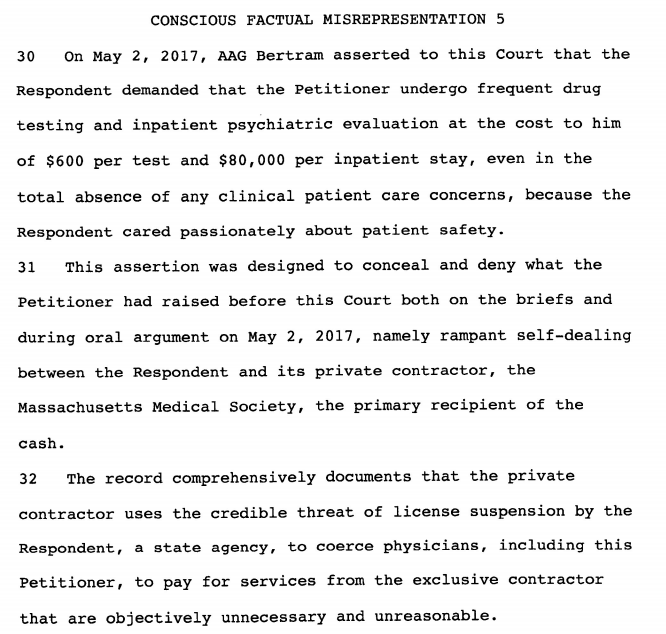 DisruptedPhysician.com author and victim of 12-step extortion presented arguments to the Supreme Court of Massachusetts May 2. He notes the blocking mechanisms that prevent evidence from even being seen, absurd denial of facts, and in my opinion clear racketeering crimes (that need a RICO investigation), going without any judicial scrutiny. This is not an isolated case. It is systemic and will affect you or someone you know if action is not taken to stop it, NOW! 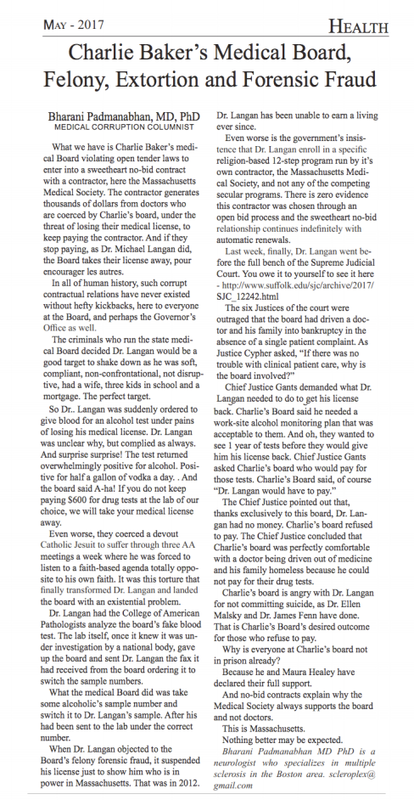 https://www.gofundme.com/PHPReform You can donate to support Dr. Langan and read comments from the people who’ve supported him here. Here is the problem — regulatory capture — which I’ve been documenting on this website, related to the control over licensing of professionals exerted by 12-step members. The reason why doctor/nurse extortion here is so pivotal is that they are the ‘nodes’ of health treatment. If we only have doctors that recommend a religious cult or are in constant fear of retaliation for resisting it, there is no hope of finding an ethical health service provider, especially now that the 12-step industry is forcing insurance companies and government insurance to pay for their fraud. See ‘parity’, and how these 12-step providers are grooming people to demand funding to providers for treatment that is clearly not helping them. “As a devout Catholic Jesuit, Petitioner believes fully in the power within and does not subscribe to any philosophy of personal helplessness or displacement of blame for one’s own volitional acts. “Petitioner disagreed fully with the spiritual underpinnings and overt religiosity of the AA 12-step program and suffered great anguish within from being coerced to attend. “Petitioner did participate without missing a single meeting but repeatedly applied to the Agency to participate in a secular version instead that would not jar so severely with his own deeply-held religious beliefs. 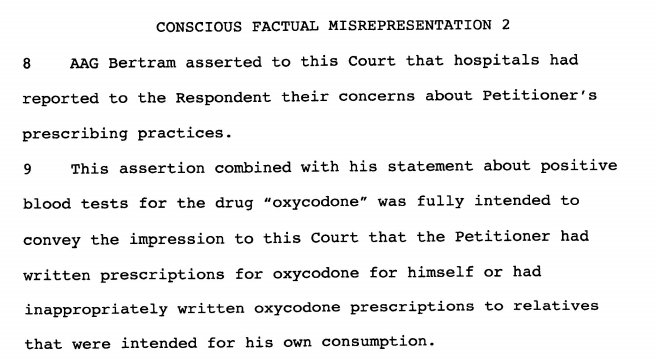 “Petitioner was also required to submit to frequent drug tests ($400-600 per month) at his personal expense which were totally unnecessary and with not one iota of real evidence in the record to support their coerced use. “The Agency declared in response that he refused to participate in the specified religion-based program required by this Agency, that he violated its order and suspended his license in February 2013. “This government agency has blocked Petitioner’s ability to earn a living ever since and even after having been informed repeatedly by numerous experts and organizations that it is in willful violation of the Establishment Clause. “But for Petitioner’s loyalty to the founding principles of the United States, which this government Agency has been proved to not share, he would have silently capitulated to crude and overwhelming government power and participated in the specific religion-based program chosen for him by the government, without raising any concerns. This was shortly after being terminated from the 12-step outpatient rehab for complaining about the cost of drug tests and step one worksheets. That was never acknowledged by Samaritan Counseling Center of the Capital Region. 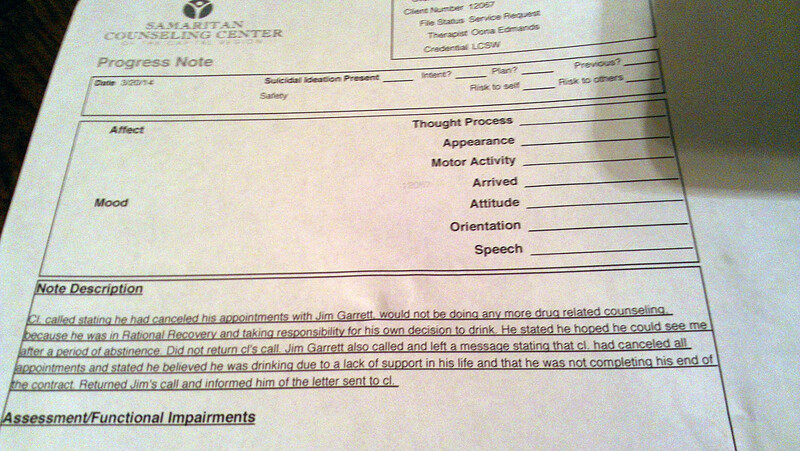 Months later, they said my claims to have done those things were ‘contradictory’ (regardless of the fact that I can prove I was there and paid Saint Peters Addiction Recovery Center (SPARC) a lot of money and the most recent interaction before I was terminated from there was with a young counselor who asked me if I could get sober ‘for her’ and had me draw a picture of what ‘powerlessness’ looked like. I drew a dead man.). 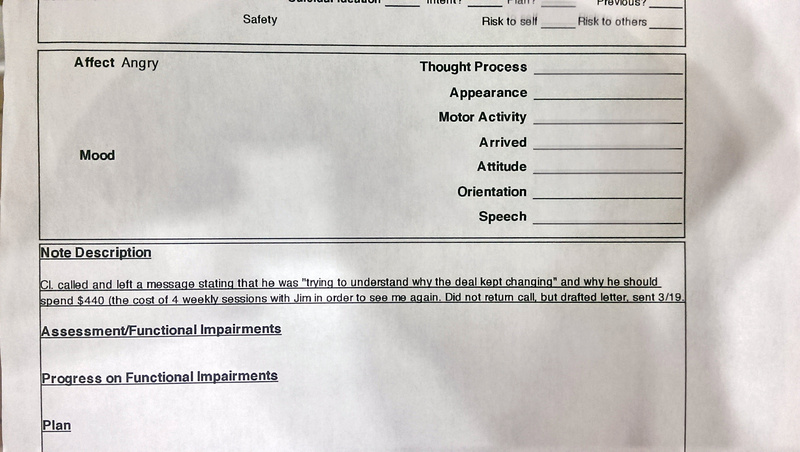 In the first few months of this nightmare, I was required to go to an inpatient 12-step rehab, and refused. (at this point my trust of him was rapidly declining after nearly a year of jumping through his increasingly expensive hoops). Why was my therapist being encouraged to not speak to me if I didn’t do 12-step treatment (I actually already know the answer, and it has to do with James Garrett realizing I was attached to her and realizing he could use that as leverage. He wrote a whole book about doing that. and you can see the reviews here.) and you can see that he was at the time charged with five felonies for this kind of nonsense here. I clearly said to her that I wanted to be done with Saint Peters Addiction Recovery Center and James Garrett’s nonsense and wanted to speak to her about it, and yet James Garrett and David Olsen both seem to have insisted that 12-step was some kind of requirement for me to resume therapy. I never was allowed to tell her what happened in the treatment she recommended, because they created this game where she was supposed to shun any contact with me until and unless I was ‘in recovery’ (which had nothing to do with drinking and everything to do with being ‘in’ AA/rehab). I’ve been trying to express this scenario in different ways for about three years now and the NYS Education Department said that pretty much nothing I say makes any sense. So I’ve kept trying to make sense, pinpointing themes like emotional extortion, gaslighting, and coercion. 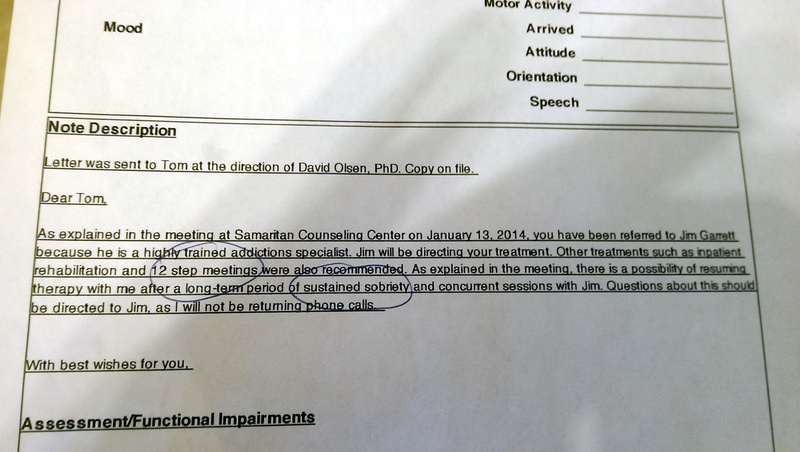 ‘recommendations’ were actually requirements for therapy at Samaritan Counseling, something I wasn’t aware of (I had thought those were negotiable) until the point I was terminated. Apparently, James Garrett thinks my attempts to complain about this are ‘Axis 2′ behavior. What I would like is for Oona Edmands to acknowledge that agreements were made and that the way I was being treated under the direction of David Olsen and James Garrett (both confirmed 12-steppers) was unreasonable and weird. I’ve spent the last three years of my life trying to understand why nobody in NYS Government seems to see the problem here.